As season’s change, your property, goes through its own particular set of trials. While your home or business is hard at work protecting you, it’s outer layers are collecting dirt, dust and debris. 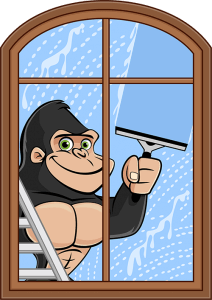 Protecting your windows is easy with Gorilla property services and our Edmonton window cleaning. In most cases, the windows of your home or business can go unnoticed for long periods of time. Instead of waiting until you feel a draft or are met with clouded glass, take pre-emptive measures to protect the condition of your property. Regular maintenance and Edmonton window cleaning can make all the difference to the life-span of your windows. It may feel solid to the touch but glass itself is a naturally porous material that degrades over time. Dirt and debris collect on the glass surface, seeping in to the material and degrading it from the inside. Enlisting Edmonton window cleaning services, guarantees more than a simple ‘wipe-down’ of your glass. Our Residential services include exterior window cleaning up to three storeys, in order to gain a proper view of the entire window. From this vantage point, we are able to relay a full report of the condition of your windows. We use all of the proper tools in order to, not only clean your windows, but to discourage dirt from collecting again right away. Our Gorillas are outfitted with eco-friendly cleaning solutions as well as rubber squeegees, designed to lower the amount of static electricity left behind to collect and attract airborne dirt and debris. Glass Is Porous: Although hard to the touch, the surface of your windows have opened pores, able to hold onto dirt and debris. Over time, debris degrades glass from the inside out, making breaks and damage likely. If your windows are not receiving regular care, one wrong move or accidental bump can mean big trouble for weakened windows. An Easy Result Is Not A Good Result: A quick wipe of both interior and exterior windows might seem like a simple enough task but there is more to clean glass than just that. Standard blue cleaners and rough materials like paper towel can leave static cling behind. This static attracts lighter, airborne materials and leaves windows dirty again nearly immediately. Inexperienced practices can also be detrimental to conditions by pushing material into corners where they are wear on glass, sills and frames. Safety Is Key: Windows on the ground floor are easily reached, but what about those that are higher up? More often than not, the main method of reaching higher windows is to lean a ladder up against an exterior wall. This precarious position limits the possibility of any positive results and increases the chances of slips and falls. Instead of struggling with inexperienced care, calling in a professional property maintenance firm means results in a safe and timely manner. Far from blue cleaners and rags, our Gorillas implement specialized tools to not only clean glass, but can extend the lifespan of windows. Rubber squeegees rid corners of buildup while eco-friendly cleaners are gentle but effective on surfaces and more ingrained stains. With the help of these tools, our Gorillas are able to perform complete cleans on windows and surrounding areas up to four stories.